When it comes to online statistics regarding gambling, number is everywhere. Truth be told, it can be challenging to create an estimate for how many people truly engage in and enjoy online gambling. One reason getting a specific number is so challenging, is because of how quickly online gambling has exploded in terms of popularity. Leading the charge is the incredible variation seen in slot machine games. Games like Twinspin Slot offer a unique approach to the traditional slot machine game. Figuring out whether or not the game is for you is another challenge entirely. With that in mind, we’ve provided a comprehensive review of Twinspin Slot including the basics of game-play and existing reviews. 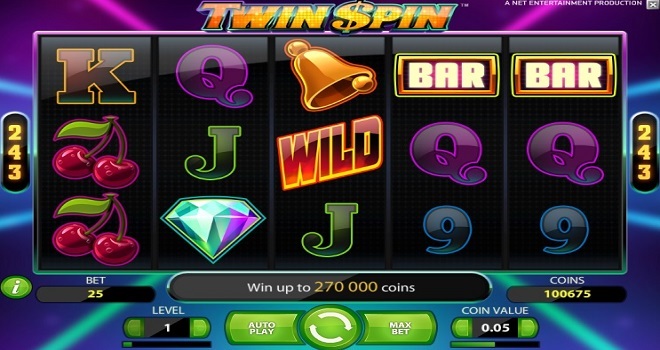 Twinspin Slot is modelled after more traditional slot machine games. It offers you a 5-reel video slot game experience. With this simple design, you have an incredible 243 bet ways to choose from. This kind of simple complexity lays at the heart of the Twinspin Slot experience. While it may appear basic at first, the mechanics behind the scenes keep people coming back again and again. The experience is further enhanced by bonuses that keep game-play interesting. Twinspin Slots was made by Net Ent Slots, a gaming company that has been in operation since 1996. Based in Sweden, Net Ent Slots is considered one of the most widely successful online casino game creators in the industry. Behind their success is a knowledge of what customers and gamers are looking for, aided by their decades in the field. With games played on more than 300 recognised portals, you no doubt have already come across Net-Ent games if you have gambled online. Verified for randomness, Net Ent is a trusted gaming company by both independent reviewers and customers alike. Net Entertainment creates a whole host of games that range in complexity, graphics, and story telling elements. While Net Entertainment keeps Twinspin Slot a nostalgic experience, they do go all out on the features hidden below the seemingly straightforward gaming experience. Because of this, Net Entertainment manages to continue its push towards engaging games without ruining the original look and feel of the casino slot machine experience. Looking for something that brings back memories of going into a casino and playing the slots? If so, then Twinspin Slots is for you. The game combines both new and old elements. It can be easily played over Linux, Windows, or Apple. Including basic symbols like the A, K, Q, J, 10, and 9, the symbols are combined with high value images any casino player will recognise. The cherry, golden bell, the number 7, and the gold bar all make a comeback. Last but not least, the diamond acts as the high pay out bonus. If nothing else, Twinspin Slot can be described as a nostalgic experience. The limitations on graphics combined with the looped music that might remind you of the 1980’s keeps the game feeling authentic. While many will consider this dated, it is easy to understand the charm behind the game and give it a try. Be aware that Twinspin Slots do not come with a separate bonus game, scatter symbol, or free spins. If you are used to playing online slot machine games, then Twinspin Slot Machine will feel like a relic from an earlier time. The lack of specific features common in contemporary slot machine games might bore those used to certain play styles and gaming events. In addition, the music and the low graphics will also turn off those used to a flashier experience. So is Twinspin Slots worth playing? Absolutely. First, if you are new to slot machine games, then you will want to play Twinspin Slots as it is a great way to get a sense for what game-play is like. Second, any person who played slot machine games at casinos will instantly recognise the aesthetics. If the last 10 years have taught us anything, never forget the powerful pull of nostalgia. To that end, Twinspin Slots does nostalgia quite well. Overall Twinspin Slots has received 4 out of 5 stars. This alone speaks to a fantastic quality that while seemingly outdated, none-the-less provides the experience many gamers are looking for. Consider it today and see if it lives up to the hype.